Now that spring has finally arrived (well, sort of…) it’s the perfect time to clean out your makeup bag, get rid of any sticky old balms at the bottom of it and freshen up your look with the new Read My Lips Mentos lip balms! With a sheer glaze left on the lips when applied, and available in 3 different flavours, you’ll be spring ready in no time. 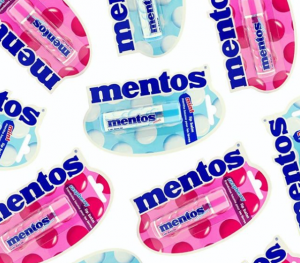 Try Mint for extra freshness, Raspberry to satisfy your sweet tooth or get hold of one of our Mentos shaped Strawberry balms to impress your friends as well as your lips! Available now, in store at Primark. P.S. Be sure to follow Read My Lips on Instagram @ReadMyLipsGB to keep up to date with all our newest launches!